Hush restaurant is nothing new. Well, that's not exactly fair, it has only been open 4 weeks, but following the popular Moxie's formula, you feel like you've been here before. 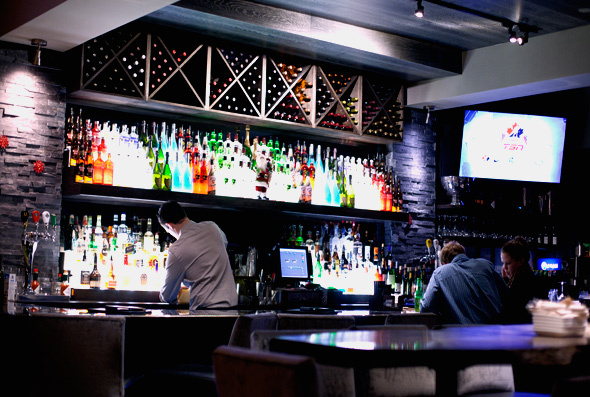 Exposed wood beams, the soaring brick bar and dark moody palette that has become as ubiquitous as the always über good looking wait staff. Our sever Chris could easily pass as a mini Tom Selleck, charming, friendly and moustached. He suggested we start off with the featured cocktail, a pineapple mojito ($4.50), which we eagerly watched him beating the pineapple into pulpy submission. We attempted to order the Slider Flight ($13) but were told that due to menu re-tooling (apparently the sliders were not up to snuff for management) have been pulled. 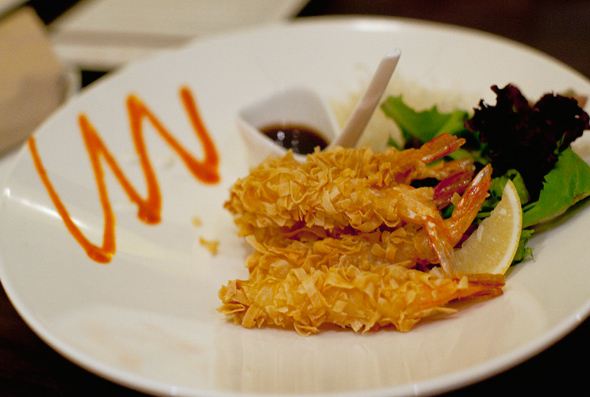 We then opted for the Tempura Wonton Shrimp ($10) and the Lobster and Shrimp dip ($14). The crispy coated deep fried wonton shrimp were accompanied by a swipe of Sriracha, and a few odd drops of crème fraiche and super salty ponzu sauce for dipping. 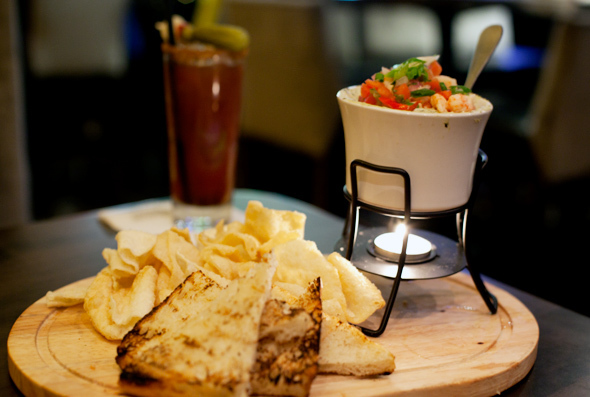 Served fondue style, with a little tea light to keep things warm, the Lobster and Shrimp dip looked good. Turned out, it was pretty bland. The crispy wontons (yes! more wontons!) were a nice side, but the flaccid and somewhat soggy grilled bread missed its mark. 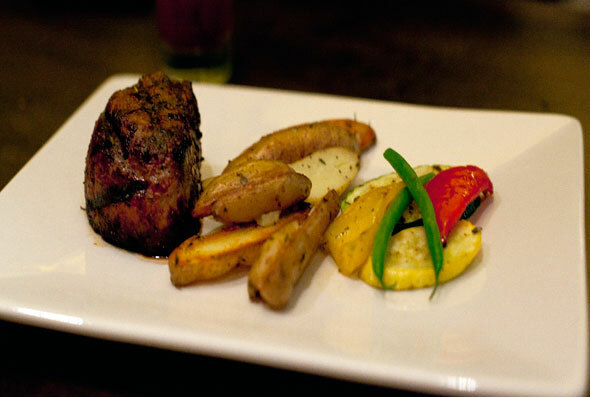 For our mains, my partner ordered the 7oz Tenderloin ($23) served with fingerling potatoes and seasonal veg. I chose the Manhattan burger ($13.50). The steak was served a perfect medium rare, with some lovely grill lines sealing in the juices. The side veg and potatoes were a nice touch, and the perfect amount of food. On the other hand, I think the poutine ($2) ate my burger. And that's not necessarily a bad thing. The poutine was outstanding, beefy gravy, loads of peppercorns and mushrooms and very squeaky cheese. The burger, with two types of cheese, bacon and toppings were outdone by the side. The burger wasn't juicy, but wasn't overcooked either. We wrapped things up like I normally do after a good meal. Start a small fire and burn things! 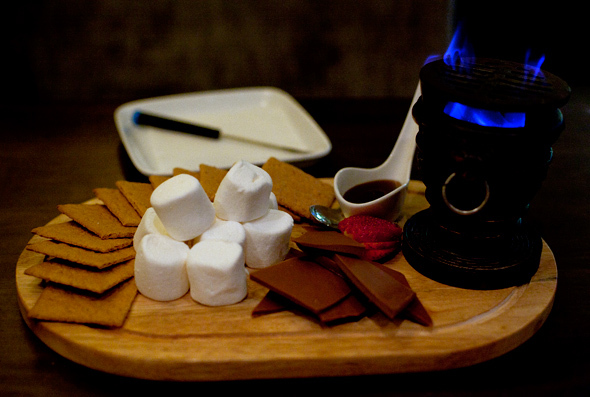 Okay, I normally reserve that for camping, but Hush brings the fire (and cozy ambience) tableside with a mini campfire experience ($13). Marshmallows, chocolate, caramel sauce and a single strawberry that I quickly yoinked. 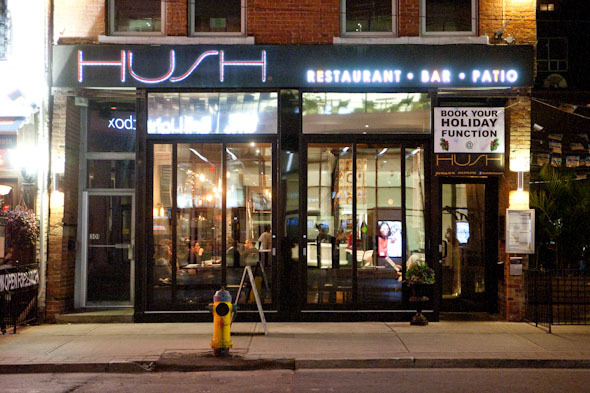 In the end, if you're stuck on the King West strip, either stalking Tiff stars or hitting the theatre , you could do a lot worse than Hush. Our total bill was $100, the portions were decent and the service really down to earth. Much like their sweet campfire.